All the children have thoroughly enjoyed our Castles and Kingdoms topic and to end it in style, we held our very own Medieval Banquet! First we created our medieval style bread for the food. We all worked hard to write our recipes. The children were amazed how much the bread rised before going in the oven. Next we created crowns and shields to ensure we all looked the part. Then we got changed ready for our banquet. All the children looked fabulous! We started off our banquet with a recreation of the Battle of Hastings, observed by some beautiful princesses!!! 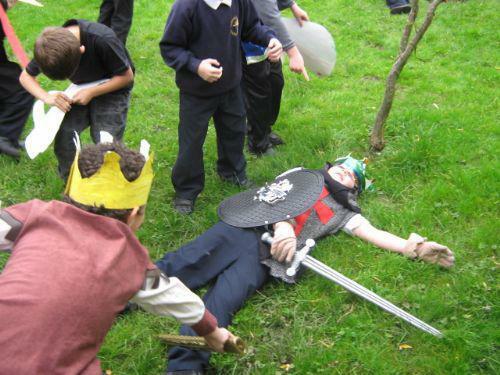 Unfortunately the battle didn't end well for King Harold, after being shot above the eye with an arrow, the nasty Normans chopped off his leg! To celebrate the Norman's victory and William becoming King, we danced to medieval music and ate our bread, pickles, cheese and apples. You'd be surprised how many children enjoyed the hard bread! We are all looking forward to more exciting activities in our next topic.